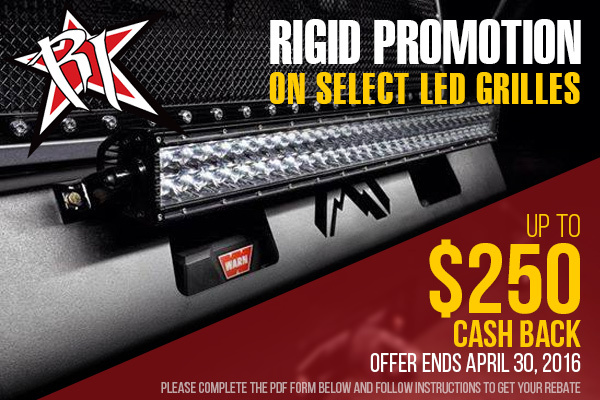 Save your money with Rigid Industries promo! - Ford F150 Forums - Ford F-Series Truck Community. Rigid Industries LED Lighting is the leader in the lighting industry. Whether you choose a Rigid LED light bar, flush mount LED light, LED grille, or any other unit, you are guaranteed to receive a top-grade part that will serve you perfectly for years to come. If you were looking to upgrade your lights, it's time to take the best visibility available and SAVE your money with Rigid Industries products! Purchase select qualifying LED Grille and receive up to $200. Don't waste your time! Act now, this offer expires on April 30, 2016. Quick Reply: Save your money with Rigid Industries promo!